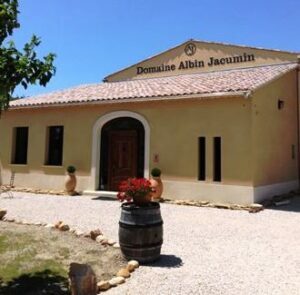 Domaine Albin Jacumin is another recent success story in the Chateauneuf du Pape appellation. Although, the Jacumin family has been involved in making wine in the Southern Rhone Valley for almost 120 years. Domaine Albin Jacumin was founded in 1991. The creation of the domaine and its vineyard came about with the vines owned by the Jacumin family were merged together. The first vintage for the estate was the 1995. The original name for the domaine was La Begude des Papes. But because the Jacumin family also owned vines in the Cotes du Rhone and marketed the wines using the same, there was some confusion in the marketplace, due to the term “des Papes” in the name. Thus, Domaine Albin Jacumin was born and their wine changed its name to Domaine Albin Jacumin Begude des Papes. In 2012, Domaine Albin Jacumin finished a complete renovation of their wine making facilities and cellars. Today, they have one of the more modern cellars in the region in both looks and functionality. Domaine Albin Jacumin owns 19 hectares of vines in Chateauneuf du Pape. .25 hectares are reserved for the production of white Chateauneuf du Pape wine. The remainder of their vineyards are used for growing red wine grapes. The family also owns 6 hectares of vines in the Cotes du Rhone appellation where they produce their Domaine Albin Jacumin les Bedines. A percentage of their harvest is still sold to negociants in the Rhone Valley. Their vines are seem widely dispersed, but most of their vines are located in the north of the Chateauneuf du Pape appellation in several different vineyards, Bois Dauphin, Brusquieres, Cansaud, Colombis, Galliguieres, Marines, Moulin a Vent, Pied de Baud, Serres, Terres Blanches and Tresquois. They have as you might expect with such widely dispersed vineyards, a mix of terroirs that are mostly rocks, stones, sand, clay and limestone soils. Domaine Albin Jacumin produces 2 red Chateauneuf du Pape wines and 1 white Chateauneuf du Pape wine. Domaine Albin Jacumin La Begude des Papes is produced from a blend of that ranges from 70% Grenache, 15% Mourvedre and 12% Syrah and 3% Cinsault. The Grenache vines are more than 50 years of age. The terroir is rocks, stone, sand and limestone soil. The vines are planted in the les Brusquieres lieu-dit. The grapes are destemmed. Vinification takes place in cement vats. The wine is aged in a combination of vats along with used, French oak barrels and demi-muids before bottling. The production is on average 2,500 cases per year. Domaine Albin Jacumin Aime is only produced in the best vintages. So far, the wine has only been made 3 times in 2010, 2012 and 2015. The wine is made from a blend of mostly old vine Grenache and various portions of all the remaining 12 allowable grape varietals. The Grenache vines are at least 80 years of age. The vineyards are located close to the village of Chateauneuf du Pape in a terroir of mostly clay and sand soil. The vines are planted in the les Marines vineyard. The grapes are fully destemmed. Vinification takes place in cement vats. The wine is aged in 100% used French oak barrels for 24 months. Not much wine is produced. In fact the entire production was only 25 cases in 2010 and it doubled to a whopping 48 case in 2012! Part of the reason for the low production is the incredibly small yields from this parcel of vines. The yields are on average only 9 hectoliters per hectare. Domaine Albin Jacumin Chateauneuf du Pape Blanc is made from a blend of 60% Clairette, 35% Grenache Blanc and 5% Bourboulenc. The wine is vinified and aged in stainless steel tanks. Not much of this wine is made. On average, close to 100 cases are produced in any vintage. Domaine Albin Jacumin can be enjoyed on the young side. Young vintages can be popped and poured, or decanted for an hour so. This allows the wine to soften and open its perfume. Older vintages might need very little decanting, just enough to remove the sediment. Albin Jacumin is usually better with 2-5 years of bottle age. Of course that can vary slightly, depending on the vintage. In the best vintages the wine should be consumed within 8-12 years after the vintage. Domaine Albin Jacumin is best served at 15.5 degrees Celsius, 60 degrees Fahrenheit. The cool, almost cellar temperature gives the wine more freshness and lift. Domaine Albin Jacumin Rouge is best served with all types of classic meat dishes, veal, pork, beef, lamb, duck, game, roast chicken, roasted, braised, stewed dishes, sausage, eggplant, tomatoes and cassoulet. Domaine Albin Jacumin is also good with Asian dishes, hearty fish courses like tuna, mushrooms and pasta. The white wine of Domaine Albin Jacumin is best served with a myriad of different seafood dishes, shellfish, crab, lobster, sushi, sashimi, chicken, pork and veal, as well as Asian cuisine. Medium bodied, elegant, polished, refined, soft and sweet the fruit is ripe, fresh and spicy. The herbs and fruit make a great combo that stands out in the finish. The wine was made from blending 70% Grenache, 15% Syrah, 12% Mourvedre and 3% Cinsault. Silky, fresh, and sweet, with freshness, complexity and early drinking charming, this sensuously textured winner is going to be great, right out of the box. The licorice, pepper and spice bring all the complexities needed to sweet ripe, soft fruits in the finish. The Grenache dominated blend includes most of the allowable grapes varieties. Luscious, elegant fruits, with silky tannins and a peppery blast of kirsch in the end note is the focus of this supple textured wine. The wine was made from 100% Grenache. Provencal herbs and lavender start the aromatic show. The wine is medium bodied, fresh, peppery and vibrant. The garrigue stands out in the finish, almost as much as the red fruits do. The wine was made from blending 70% Grenache, 15% Syrah, 12 Mourvedre and 3% Cinsault. Medium bodied, spicy, easy drinking, red berry filled wine produced from a blend of 70% Grenache, 15% Syrah, 12% Mourvedre and 3% Cinsault. A juicy blast of sweet, ripe, fresh, peppery red fruit delivers from start to finish. From a blend 75% Grenache, 15% Syrah, 5% Mourvedre and 5% Cinsault, the wine reached 14.5% alcohol. Oak, black pepper, garrigue and black raspberries, this medium bodied, forward kirsch expression is already fun to taste. Medium bodied and filled with light, fresh, peppery red berries, this is a wine to drink on the young side.